Red serow in parts of Mizoram were decimated by the capripox virus in 2015 but appear to be making a comeback, as evidenced from this photograph, taken in July 2016. Serow are medium-sized goat-antelopes of the genus Capricornis. The taxonomy of serows is not completely resolved; descriptions, range maps, and assessments of conservation status in the literature vary because sources differ on nomenclature and specific/subspecific status of the various taxa. There are six recognized species of Capricornis, of which two occur in India. The Himalayan serow (Capricornis thar) is found over most of the the entire Himalayan range and the Red Serow (C. rubidus) is confined to the South Assam Hills, below the Brahmaputra river. 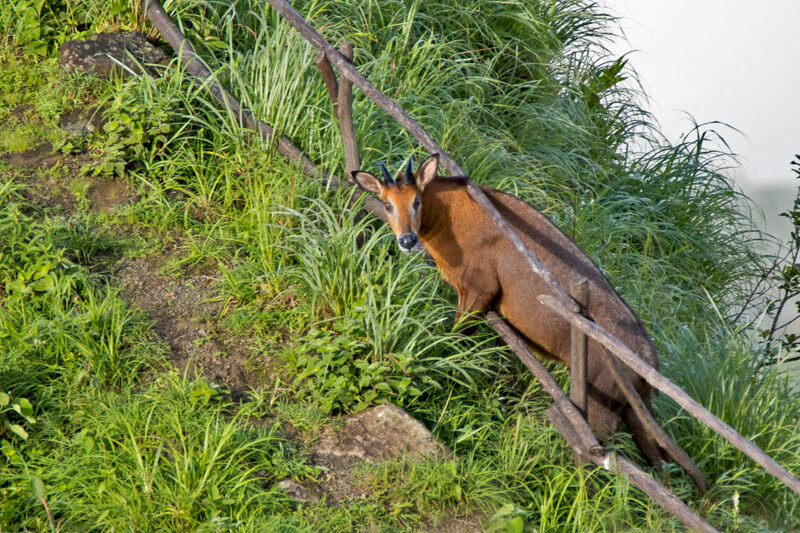 The Red Serow inhabits rugged steep hills and rocky places, as well as hill and mountain forest areas with gentler terrain. In the Indian Northeast, Serow are heavily hunted, mostly for local consumption. But other body parts, including the forelegs, heads, horns and fat from the stomach region are much sought after for use in traditional medicine. According to the Forest Department, there was a goat pox epidemic caused by the Capripox Virus that wiped out the Serow last year (2015) in Hmuifang, Mizoram. This is perhaps the first photographic record from the same location after the outbreak (taken on 30th July, 2016). Hopefully, they are making a comeback. Duckworth, J.W. & MacKinnon, J. 2008. Capricornis thar. The IUCN Red List of Threatened Species 2008. The author is a Pune-based software consultant, who loves to travel and photograph birds.